i-graduate, part of the Tribal Group, has appointed international education specialist Stephen Connelly as the new director of its Australian operations. In 2016 Stephen received the IEAA Excellence Award for Distinguished Contribution to International Education (www.ieaa.org.au/what-we-do/award-winners-2016) as recognition of his work over 25 years in the education sector in Australia and around the region. Over the past four years Stephen has run a highly successful consulting firm, GlobalEd Services, specialising in international education. The role with i-graduate will enable clients of both organisations to access a broad suite of services and products, from benchmarking and surveying to specialist international education advice and assistance. Over the past 10 years i-graduate has become an integral part of the education sector in Australia, including, importantly, Australia’s $19b international education industry. The opportunity to combine the international education expertise and focus of GlobalEd Services with i-graduate’s suite of products and services is exciting, and I look forward to continuing to further growing and providing added value to our clients and to i-graduate’s partnerships in Australia. i-graduate have been delivering comparative insights to the education sector in Australia since 2006, helping institutions deliver a world-class student experience to enhance their competitive advantage. Stephen’s experience and approach is the perfect counterpart to ensure our continued success partnering providers in this dynamic market. Stephen has begun the transition process, working closely with outgoing Director Kevin Brett, and will fully assume the role in February 2017.
i-graduate tracks and benchmarks student and stakeholder opinions across the entire student journey, from prospective students to alumni. Established in 2005, i-graduate has obtained feedback from 2.7 million students and worked with 1,400 institutions in over 30 countries. i-graduate runs the world’s largest survey of international student satisfaction - the International Student Barometer - as well as surveys of domestic students, TNE students and distance learners, English language learners and education agents. In Australia i-graduate also runs the suite of benchmarking exercises for the Australian Universities’ International Directors’ Forum (AUIDF). Based in Melbourne, Australia, GlobalEd Services assists education institutions to achieve their internationalisation objectives. Drawing on 25 years’ experience in Asia, Europe and North and South America, GlobalEd Services provides advice and assistance in strategy and business development, partnerships, relationship management, international student recruitment, transnational education, global mobility, staff professional development and organisational structures and review. I'm about to head out to the airport to collect an international guest attending this year's AIEC in Melbourne - the excitement about the conference is palpable. Talk back radio is full of discussion about international education, it's in all the papers, and even on the tele, which goes to show that positioning the conference strategically between the football and cricket seasons was a smart move. They're even upgrading the freeway for the occasion (although I think they are behind schedule). Competition for the moniker of this year's biggest topic includes: Do we need Agent Quality Frameworks? How are all those international education strategies tracking (Australia, NZ, UK, Canada, Victoria, NSW, etc. etc.)? What do we do with all that data? Will students continue to travel internationally for education, and if so, where to, where from, and why? Is TNE the next big thing, or just the next big risk? and what is TNE anyway? That and more, coming to you from the Melbourne Convention Centre this week. See you there. Reputation and profile, available programs, organisational structures, systems, policies and processes, staff capacity and capability differ at every institution. Student recruitment objectives may be broadly similar from one institution to another (increase numbers, fewer more productive partnerships and channels, improve or maintain compliance, recruit quality students, reduce cost of acquisition, improve customer experience, streamline processes etc. ), but the road map for achieving success rarely is. Institutional readiness to support proactive recruitment strategies is a significant variable. There’s no one-size-fits-all approach to improving student recruitment performance, but there are some fundamentals that are critical to the success or otherwise of an institution’s recruitment strategy. Where do students come from and how can we reach them? What do they want to study and where do they want to study? It’s difficult to answer these and similar critical questions without access to good data, but the data alone are not enough. Business intelligence and market research are key to developing targeted recruitment strategies, and to measuring performance and success. The best recruitment operations are always underpinned by access to data together with the ability to analyse data. Q: How many enquirers or applicants to I need to get one enrolled student? A: About 4.5 applicants from 25 enquirers. And those are just the average numbers. If you are in the volume game, consider generating (and managing) 25,000 enquirers, to achieve 4,500 applicants, to commence 1,000 students in a given year. Consider also that your 25,000 enquirers might require 4 or 5 interactions or exchanges each during the enquiry process and you either need some help or a good lie down. Visibility, physically on the ground in source markets, via agent networks, and in cyberspace, directly impacts your institution’s ability to generate interest from prospective students. Once you have generated interest, you have something to work with. But can you handle the traffic - can your resources, systems and processes manage the volume effectively? and don’t forget in-country representation to complement your digital strategy. Now do that in your top ten markets. Top three? Have fun. The upside is that a digital approach to marketing, lead generation and recruitment might enable you to divert scarce human resources to focus on high-value high-return applicant management efforts at a later stage in the recruitment process, when prospects have a greater likelihood of conversion than at the enquiry stage. A 2014 Nielson report confirms what we probably already knew, that smartphone users are increasingly reliant on their devices when researching, comparing and purchasing goods and services online, including education. This is an important consideration as we develop a better understanding of Gen Y students’ purchasing habits. Institutions that are not discoverable, responsive to devices, engaging or personal will be overlooked by prospective students who will favour more accessible options. Students, like anyone, are looking to simplify and streamline their lives. An institutional app that follows the student from initial contact through to enrolment, graduation and beyond will become the benchmark of exceptional student and alumni engagement. A web of intrigue, or an intriguing website? Everyone is trying to convert prospects into enrolled students. Most businesses fail to convert anywhere from 90-98% of hard earned website traffic, so obviously your prospects aren’t just interacting with you. You’re competing for their attention with everyone else. How can you convert an interested prospective student before your competitor does? Your website underpins your entire online presence - all roads must lead here. A website audit is a great place to start. Understanding your prospects’ behaviour whilst on your site is critical and can be done via Google Analytics. Here you can see your site’s wins and losses, and where you have opportunities to improve web performance. It’s all about stickability. Are you complementing your campaigns with dedicated landing pages? Can prospective students find the information they need, quickly and easily? Can visitors make an enquiry via web-form or chat? Go it alone or BFFs? If you want to go it alone, stop reading this now and get back to work – there’s too much to do. Otherwise, keep reading while we consider some partnerships you need to activate to help you achieve your goals. International offices tend to focus on their Best Foreign Friends – recruitment agents, in-country representatives or partner institutions overseas. Of course they are important, and you need a strategy to manage those relationships and monitor performance. But there’s some important stakeholders closer to home you need to cosy up to. Since you never have enough resources to do everything you’d like to, your Best Faculty Friends should be your first port of call. Ultimately that’s where the students end up anyway, so figure out a way to utlilise faculty resources to their benefit and yours. Devolved structures within universities often mean that international offices have not enough or little direct control over the marketing resources required to develop, implement and support specialised international marketing and recruitment strategies, so it’s not just faculty friends you need to cultivate. “Who manages our Instagram account, again?” Central marketing teams should be besties with their international office colleagues anyway – you’re all on the same side, aren’t you? One way to win over your BFF’s in the academy is to focus on program recruitment. There’s at least a couple of ways to go about it. The first will require an understanding of demand at the program level, and some neat low-cost promotional strategies, but that’s where digital recruitment steps up to the plate. Virtual fairs, utilising your prospect pool, drawing information from your website, and driving interest through your key recruitment channels, facilitated by real time advising by faculty, can be done from your desktop, with not an airport lounge in sight. In-country events can also be organised - obviously more expensive – but however you go about it, targeted program level campaigns can be highly effective. Another approach is cohort recruitment from overseas partner institutions into specified programs. This is a step beyond stock standard articulation arrangements, and requires a solid relationship and shared objectives with your partner, but can be highly effective not only in increasing numbers, but also balancing market shifts that impact retail (i.e. agent) recruitment activity. And the most successful program collaborations lead over time to spin off collaborations between partners including two-way student mobility, staff mobility and research collaborations. Where do I sign up? We’ve hinted at this already – no point generating lots of interest if you can’t respond efficiently and effectively to convert prospects into students. This applies to managing enquiries and applications, getting offers back to applicants quickly, following up offers that haven’t been accepted, processing acceptances and starting the visa application process. When was the last time you conducted a process audit? And what about your BFF’s in the academy? Encouraged by your program level campaigns, are they working diligently to turn around the more difficult applications so you can get a timely response back to students and agents? Or are they buried under a pile of term papers? Can you help them and help yourself by strategically utilising automation technology to streamline your conversion and engagement with prospects? So that’s a lot to think about if you want to improve student recruitment performance. Did we mention having a plan (which is where you need to start)? Hang on, I think there’s one in this drawer. Two staple undergraduate business specialisations at Australian universities are Marketing and Management. We studied onshore enrolment data from 2012-2014 to see how popular they are with international students. 13 universities reported onshore enrolments in a Bachelor of Business (Marketing) or equivalent program between 2012 and 2014. 3,690 total students were enrolled in the program in 2014, with 805 or 21.8% international. The largest program in 2014 enrolled 279 international students, or a remarkable 34.6% of all international students studying the program in Australia at the time. Domestic student enrolments over the period rose by 11.6%, in contrast to international student enrolments, which declined substantially by 22.6%. Of seven universities with more than 50 international enrolments in 2012, five had suffered significant decreases in enrolments by 2014 and only two showed growth. As noted above, 21.8% of onshore students in Marketing programs in Australian universities in 2014 were international, down from 28.7% in 2012. The range of variation between universities was substantial, from 85% at the university with the highest proportion of international students to just 4.5%. International students from 63 countries enrolled in Marketing programs at Australian universities between 2012 and 2014. The top 10 source countries accounted for just over three-quarters of all international students - one quarter of them from China, followed by Indonesia, Malaysia, Vietnam, and Hong Kong. In the context of an overall decline of 22.6% in international enrolments in Marketing programs between 2012 and 2014, important source countries showed declining trends. Four of the top five countries fell – China, Indonesia, Hong Kong, Malaysia – while only Vietnam increased enrolments. While the Bachelor of Business (Marketing) remains a popular program with international students from a wide range of countries, enrolment trends generally between 2012 and 2014 were significantly downward. 11 universities reported onshore enrolments in a Bachelor of Business (Management) or equivalent program between 2012 and 2014. 5,775 total students were enrolled in the program in 2014, 1,589 or 27.5% of them international. The largest program in 2014 enrolled 478 international students, or just under one third of all international students studying the program in Australian universities at the time. Domestic student enrolments over the period rose by a substantial 36.2% while international student enrolments fell 2.5%. Trends varied between universities - five experienced positive growth in international student enrolments, five fell and one remained stable. 27.5% of students in the program in universities in 2014 were international students, down from 34.7% in 2012. Again, there was considerable variation among universities in the proportion of their undergraduate management students who were international in 2014, from 48.7% down to 5.9%. International students from 89 countries enrolled in Bachelor of Business (Management) programs onshore in Australian universities between 2012 and 2014. The top 10 source countries accounted for more than 80% of all international students, with almost one third from China, followed by Hong Kong, Singapore, Vietnam, Malaysia and Indonesia. China declined significantly between 2012 and 2014, offset by increased numbers from India, Sri Lanka and Vietnam. The Bachelor of Business (Management) is a program popular with international students from a wide range of countries. Enrolment growth in recent years has been marginally negative. Both programs show an increase in popularity with domestic students, contrasted with falling popularity among international students. This analysis is based on data from the Australian Government’s Higher Education Information Management System (HEIMS) and university websites. The accuracy of the HEIMS analysis is entirely dependent on the data as submitted by the higher education institutions concerned. There is sometimes considerable variation in the way that institutions report their data. The analysis excluded joint or double degree programs, single year Honours programs, programs with only domestic enrolments and programs with international enrolments of less than five over the period. 22 of 40 Australian universities are in the world's top 400 - those 22 universities enrol 65% of Australia's university students. 65% of Australia's 1.3 million students are in universities in the world’s top 400. 112 of over 3,000 four year degree granting institutions in the USA are in the world's top 400 - those 112 universities enrol 20% of America's 13.4 million students. 20% of 13.4 million US students are in universities in the world's top 400. 46 of 161 UK universities are in the world’s top 400 - those 46 universities enrol 33% of the UK's 2.3 million students. 33% of 2.3 million UK students are in universities in the world’s top 400. 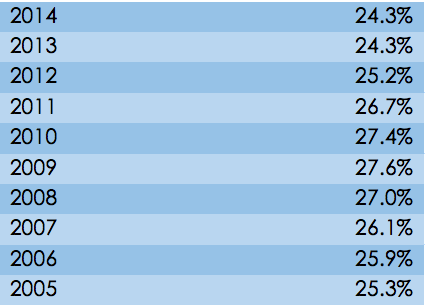 Just one way of looking at the rankings results. Discussion about the significance of international students for Australian universities often centres around their revenue contribution, and the risk associated with maintaining or growing enrolment levels in a system with a greater proportion of international students than almost any other in the world. This ignores the importance of international students in classrooms and on campuses around Australia, bringing different perspectives and helping local students develop a global mindset, including for about 15% of local students participation in overseas mobility programs. Acknowledging the need for a more comprehensive appreciation of Australian universities’ internationalisation programs, this article continues the focus on enrolment and revenue, to clarify the extent of the reliance or otherwise of Australian universities on international students. Each year Australian universities report enrolment and revenue data to the Department of Education and Training (DET). This data set is a rich source of information about enrolment, revenue, academic success and attrition rates. Of specific interest are proportions of students who are international, proportion of revenue sourced from international students, and academic success of students. 2014 enrolment data are now available, with finance data released around November each year. Open Doors and OECD data show that Australia’s proportion of international students compares with UK 17%, Canada 16%, USA 4.2%. ​Does 16.3% represent unhealthy over-reliance? I don’t think so. There is risk involved in managing any revenue source. Far worse to be over-reliant on government revenue. The prosecution respectfully presents as evidence recent shenanigans in Australia purporting to be informed policy debate about university funding, with a starting point of 20% reduction in government contributions. Give me business risk any day. Footnote: Australia in 2012 had the second highest proportion of international students among its undergraduate population of any OECD economy, behind Luxembourg. Confused about our over-reliance on international students? Just read this article in The Pie News - Aus: int'l students contribute most tuition fees, fears of over-reliance - which opens with the assertion that international students "account for almost 72% of total tuition gains at public universities" based on an interpretation of a paper recently published by Andrew Norton and Ittima Cherastidtham at the Grattan Institute in Melbourne. The paper University fees: what students pay in deregulated markets deals with revenue from full fee-paying students at Australian universities, consisting almost exclusively of international students and domestic postgraduate coursework students. Commonwealth supported places, which provide the bulk of tuition revenue to universities either via direct government funding or student contributions, are not mentioned in the paper as they are not relevant to the discussion. Norton and Cherastidtham have some interesting things to say about tuition fees, including the propensity of both international and domestic students to opt for expensive courses at well-ranked institutions, providing evidence to support that old international education truism that price is a proxy for quality. But they are not concerned with other forms of funding, at least not in this study. The Pie News article is potentially confusing because it focuses on international student revenue as a portion of tuition paid by full fee-paying students only, not as a portion of total revenue, and suggests this is some form of over-reliance. There's no doubt international student tuition fees are important, but they account for about 18% of total revenue at universities in Australia, so the 72% figure is misleading. Fees from domestic postgraduate students account for about 7% of total revenue. In a primarily public Higher Education system it is hardly surprising that there are these two cohorts of privately funded students and virtually no others - the Pie News article however gives the impression that the overwhelming majority of tuition revenue at Australian universities comes from international students, which is not the case. There's an interesting discussion to be had about whether or not 18% of revenue constitutes over-reliance, particularly when that system-wide 18% includes universities with up to 30% of total revenue derived from international students. But it's not helpful to take the discussion out of context and bandy about figures like 72%. The Grattan Institute paper flags future work on "how universities spend income from deregulated markets (and the) implications for Australian higher education policy." That's something to look forward to, but let's try to get the reporting right when the time comes. Using data from the Australian Government’s Higher Education Information Management System (HEIMS) we examined enrolments of international students at Australian universities in two postgraduate business courses, the Master of Business Administration (MBA) and the Master of International Business (MIB). Onshore and offshore enrolments over a three-year period (2011-2013) were examined. This is the most up to date data, 2014 data not being available until mid 2015. The analysis focused on those Australian universities offering the two designated courses. Data allowed for analysis in numerous ways, including as a time series. However, for initial purposes, findings are presented for 2013 only. Selected charts and tables are presented in this summary of findings. Sets of charts and tables were prepared for the Australian universities as a whole as well as for the Group of Eight (Go8), Australian Technology Network (ATN), Innovative Research Universities (IRU) and Regional Universities Network (RUN). The full sets are not shown here for reasons of brevity. Substantial tabulated data form the basis of the analysis. 2. Benchmarking universities within designated network groups (Go8, ATN, IRU, RUN). 2. Market share represented by enrolled international students compared with the national average and with the average for the designated university group. The findings reveal substantial differences in international student enrolments among Australian universities for these two courses. Equally, within like groupings of universities, where greater uniformity in enrolment patterns might have been expected, there are significant differences between universities. In 2013, a total of 16,301 students were enrolled in Australian MBA courses, on and offshore. 6,949 or 42.6% were international students. 56.7% of those 6,949 international MBA students were enrolled onshore, the rest in offshore courses. 29.9% of onshore MBA students were international. 39 Australian universities reported enrolments of international students in MBA courses in 2013. 6 universities had international MBA student numbers exceeding 50% of total MBA enrolments. Federation University led the pack on this basis with 77.9% of its MBA students being international, followed by the University of Southern Queensland (75.9%), Charles Darwin University (71.3%), James Cook University (71.1), Flinders University (66.7%) and Central Queensland University (53.4%). The majority of universities however enrolled proportions of international students well under the average. Enrolment numbers as well as enrolment proportions were tiny in some cases. 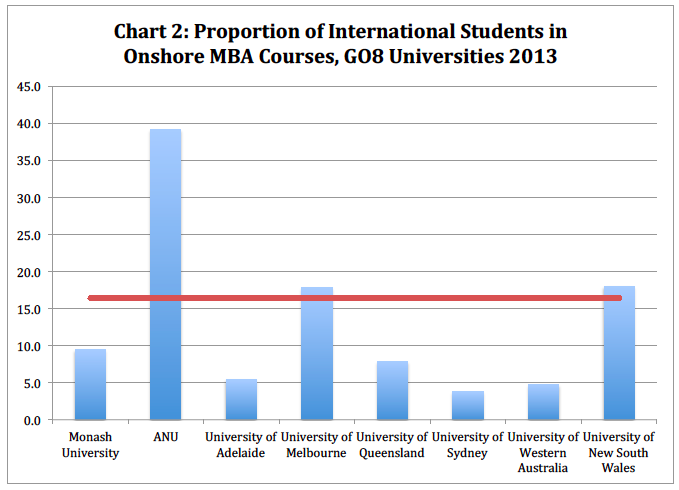 Chart 2 below shows the proportion of international enrolments in onshore MBA courses for the Group of 8 universities. ANU was the standout university with enrolments of international students more than twice the average for the Go8, and the only Go8 University with proportions of international students above the national average. The University of Melbourne and the University of New South Wales were the only other Go8 universities enrolling proportions of international students into their MBA courses at or above the average for the group. Monash, Adelaide, Queensland, Sydney and Western Australia enrolled very low proportions of international MBA students. HEIMS data also allow examination of market share. 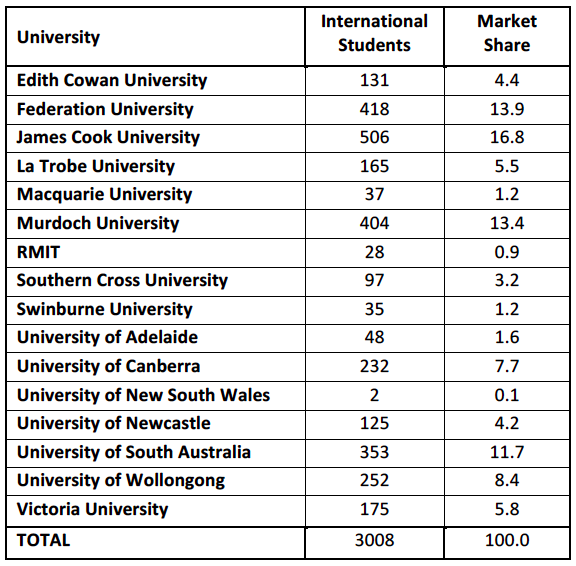 In 2013 the ATN universities, for example, attracted 10.3% of the total market share of onshore international MBA enrolments (Table 1). The number of international enrolments amongst the ATN universities varies widely however, with some of the ATN universities having very small numbers of international MBA students. University Technology Sydney enrolled 75.1% of international students in MBA courses at ATN universities, followed by RMIT (13.4%). Market share for the remaining ATN universities was small in comparison. Apart from University Technology Sydney, ATN universities enroll far fewer and far smaller proportions of international students than Australian universities generally. 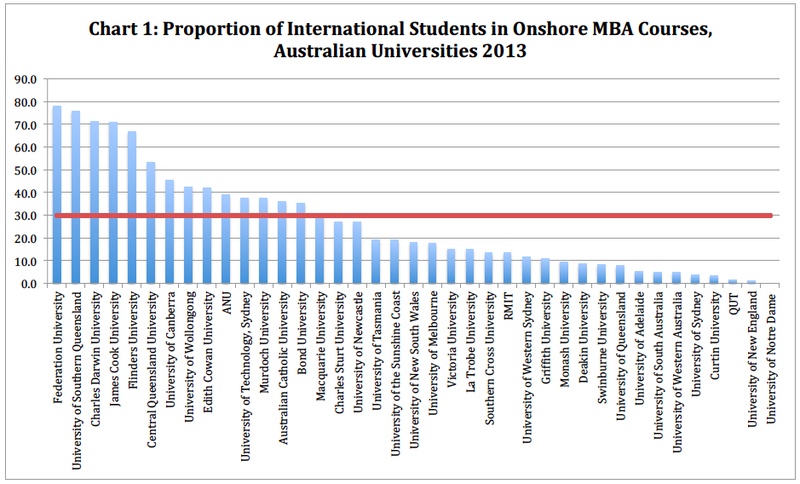 16 Australian universities offer the MBA offshore, enrolling a total of 3,008 international students in 2013. 4 universities (James Cook, Federation, Murdoch and UniSA) captured more than half of the market share with James Cook the outstanding performer (16.8%). In 2013, a total of 2,265 students were enrolled in Australian MIB courses on and offshore. 2,056 or 90.8% were international students. 71.6% of those 2,056 international MIB students were enrolled onshore, the rest in offshore courses. 87.6% of onshore MIB students were international. The MIB is a course of considerable interest to international students. 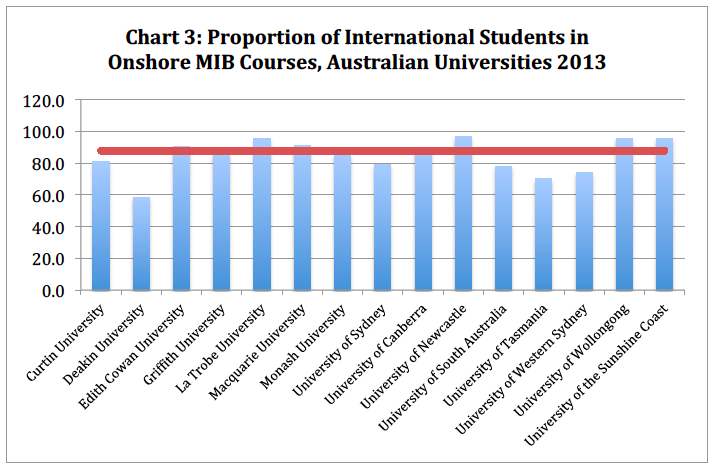 15 Australian universities reported enrolments of international students in onshore MIB courses in 2013 (Chart 1). 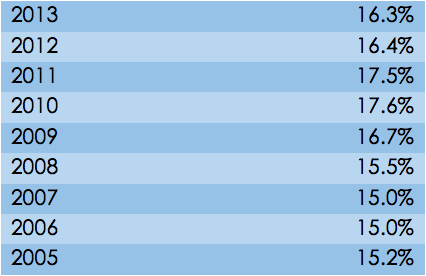 7 universities (Edith Cowan, La Trobe, Macquarie, Canberra, Newcastle, Wollongong and Sunshine Coast) had proportions of international students in the MIB at or above the average, with Newcastle having the highest proportion (96.8%). In terms of onshore market share, Wollongong (18.3%), Monash (16.7%), La Trobe (13.4%) and Macquarie (12.9%) universities led the rest of the country for international enrolments in MIB courses. Four Australian universities (Curtin, La Trobe, Monash and Wollongong) offer the MIB offshore, exclusively for international students. No Australian students are enrolled offshore in the MIB. Wollongong had just over 50% of the total offshore market. The remaining three universities each had around a fifth or slightly less of total offshore MIB enrolments. The data analysis has been based on reports specially commissioned from the Commonwealth of Australia, drawing on the Australian Government’s Higher Education Information Management System (HEIMS). The accuracy of the analysis is entirely dependent on the data as submitted by the universities. As users of HEIMS know, there is sometimes considerable variation in the way that universities report their data. For example, names for the Master of Business Administration and for the Master of International Business courses may vary between universities and are sometimes reported by universities under different HEIMS course codes. For the purpose of the present analysis the researchers investigated courses only with the names “Master of Business Administration” and “Master of International Business. These were the great majority of the courses and the great majority of associated enrolments appearing in the relevant HEIMS reports. Courses having specialised names (e.g. Master of Business Administration (Health Services Management); “International Master of Business Administration”; “Executive Master of Business Administration”) were excluded. Also excluded were joint degree programs (e.g. “Master of Financial Analysis/Master of Business Administration”; “Master of Law (Juris Doctor)/Master of Business Administration”; Master of International Business and Master of Commerce). Finally, HEIMS reports do not provide fine grade data for enrolments less than 5. 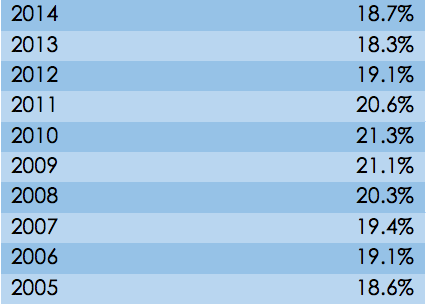 A small number of enrolments that were reported as “>5” have been averaged at “2” for the purposes of the analysis. Beginning next Thursday 2nd April in Townsville Austrade will commence a series of consultations workshops around the country to develop a long term international education market development strategy for the next decade. Austrade's plan, Australian International Education (AIE) 2025, will focus on Austrade's specific remit, to assist education providers and other organisations to maximise their potential in growing their international education business. The consultation workshops will provide an update on development of the plan thus far, an opportunity to listen to the sector's views on further development of that plan and a forum for participants' to discuss challenges to and opportunities for future growth. Trade Minister Andrew Robb in the Higher Education Supplement on Wednesday wrote that he has asked Austrade to "work with the international education sector this year, including with non-traditional players, to develop a long-term market development strategy out to 2025 ... (complementing) ... the work of federal Education Minister Christopher Pyne, who is finalising a broader national strategy for the international education sector." He posited that Australia could teach up to 10 million students in the region in the next 10 years "if we adopt a wide range of different models across higher education, vocational education and training and secondary levels." That's some sort of challenge for the sector. But it could mean that education could challenge for the position of Australia's #1 export if we approach anywhere near those sort of numbers. To achieve this, we need to be thinking about innovation and disruptive technologies, not just standard modes of interaction and delivery. The UK, Canada and New Zealand have all released international education strategies in the past two years, in each case with a focus on increasing international student enrolments. Competition for international students, those who travel overseas for their education and those who access international education at home, is intense and can only be expected to become more so, and not only from our traditional rivals. We need a plan if we are to compete successfully, and we need a coordinated approach to business and market development. Sounds to me like the Chaney recommendations are starting to be implemented. Imagine being part of a country whose major contribution to the world is education and education opportunities, instead of coal and iron ore.